As I have mentioned previously, The New York Times 60-MInute Gourmet was my go-to cookbook for years. In my recently rediscovered copy, on a heavily stained page 170, is a recipe for paella, a dish I had never tasted before trying to make it myself. I cooked that recipe a lot early on, then gave up on it because it never seemed to turn out the way I expected. The Cook’s Illustrated recipe I tried much later delivered on flavor but failed completely on texture: mushy rice, dry chicken, overcooked vegetables. It eventually dawned on me that a utensil called a paella pan existed for a particular reason: it was specifically designed to cook paella. 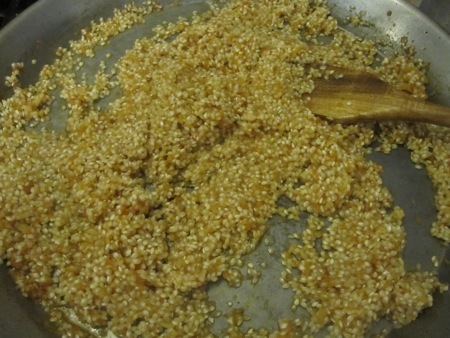 (The rice needs to cook quickly, and a wide shallow pan promotes evaporation.) I found an inexpensive aluminum nonstick version at IKEA, which improved the dish significantly. 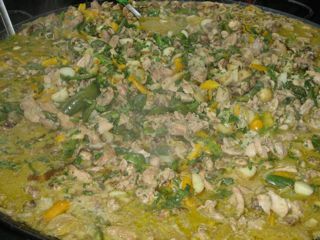 ... and a similary sized pan of chicken paella. After one taste of this version I knew I still had work to do. 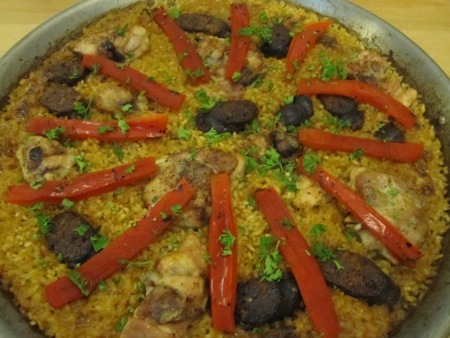 Some of the rice was crispy, called socarrat, a result of charring at the bottom of the pan. I knew that my non-stick pan would never let me produce that result, so I found a local source of real carbon-steel pans, which also provided me with the other missing component: Valencian bomba medium-grain rice. With the correct pan and rice, I was soon making paella I wanted to eat. 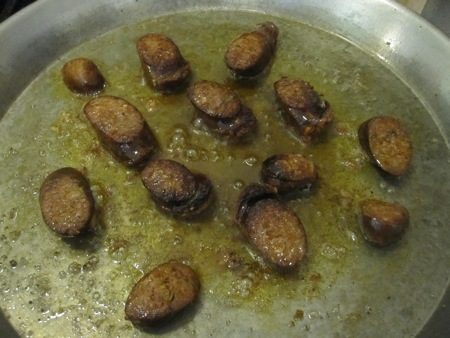 What better recipe could I come up with to showcase my newly-made cold-smoked chorizo? I had learned a lot about this dish after years of trial and error, and had one more variation to try. 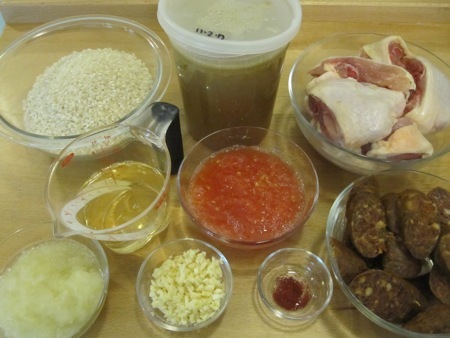 I assembled a minimal set of ingredients: four chicken thighs split across the bone, two cups of bomba rice, four cups of homemade chicken stock, a medium onion and a larger tomato (both grated on the large holes of a box grater), two tablespoons of chopped garlic, a half cup of white wine, a healthy pinch of saffron, and two links of chorizo cut on the bias into thick slices. I heated the stock and let the saffron steep in it until needed. I browned the chicken in olive oil over meduim high heat, removed it from the pan, added the chorizo, and cooked until brown and the oil had acquired a lovely orange tint. 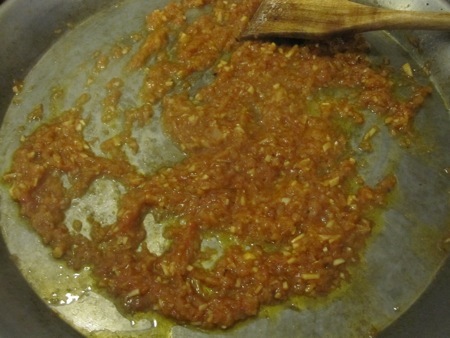 After removing the chorizo, I prepares a sofrito by adding the onion, garlic, tomato, a teaspoon of tomato paste, and a pinch of salt, and cooking until the mixture darkened and thickened. I deglazed the pan with the wine, then added the rice and stirred to coat, about two minutes. 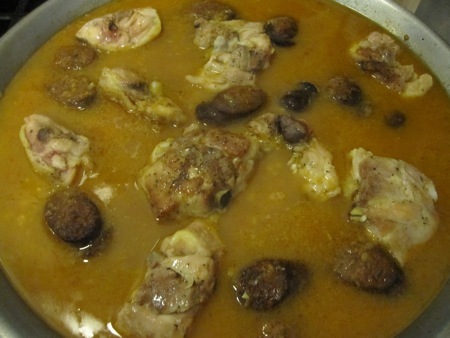 I stirred the saffron-infused stock, into the rice, returned the chorizo and chicken to the pan, brought it to a simmer, and then set it in a 450°F oven. Cooking in the oven instead of on the stovetop was the new variation. No matter how large the stove burner may be (I have a very large 15,000 BTU burner, but it’s nowhere near the size of the gas rings I saw the pans siting on in the market), it won’t cover the entire bottom of a 16-inch pan. A hot oven, however, will heat the pan evenly. After fifteen minutes, the rice was almost completely cooked, so I shut off the heat and let the pan sit in the oven for another ten minutes before moving it back to the stovetop. I rotated the pan over a burner set on high, crisping the rice on the bottom and sides. I topped the pan with some chopped parsley and roasted red peppers. This entry was posted in food & cooking and tagged charcutepalooza, cooking, food, pig. Bookmark the permalink.